Be the first to share your favorite memory, photo or story of Ursula. This memorial page is dedicated for family, friends and future generations to celebrate the life of their loved one. 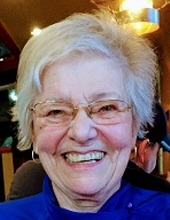 CHAPMAN, Ursula Marie- Age 79, of Grand Blanc, died Wednesday November 28, 2018. A memorial service will be held 2PM Thursday December 13 at St. Christopher Episcopal Church, G-9020 S. Saginaw St., Grand Blanc. Father Donald Davidson officiating. Graveside service to follow. Arrangements provided by Sharp Funeral Home and Cremation Center, 6063 Fenton Road, Flint. Ursula was born August 9, 1939 in Bonn, Germany the daughter of the late Zopf and Elizabeth Lotte (Koenig) Kay. She came to the United States in 1969, living in Chicago, IL. Ursula married Henry (Darroll) Chapman in 1986 and he preceded her in death in 2014. Mrs. Chapman retired from the General Motors Grand Blanc Metal Fabrication plant with many years of service. She enjoyed knitting, traveling and was a travel agent for many years. Surviving are: close friends, Shelby Warren, Nancy Hopson and Flo Gjerstad and several nieces and nephews in Germany. tributes may be posted on the obituaries page of www.sharpfuneralhomes.com. To send flowers or a remembrance gift to the family of Ursula Marie Chapman, please visit our Tribute Store. "Email Address" would like to share the life celebration of Ursula Marie Chapman. Click on the "link" to go to share a favorite memory or leave a condolence message for the family.